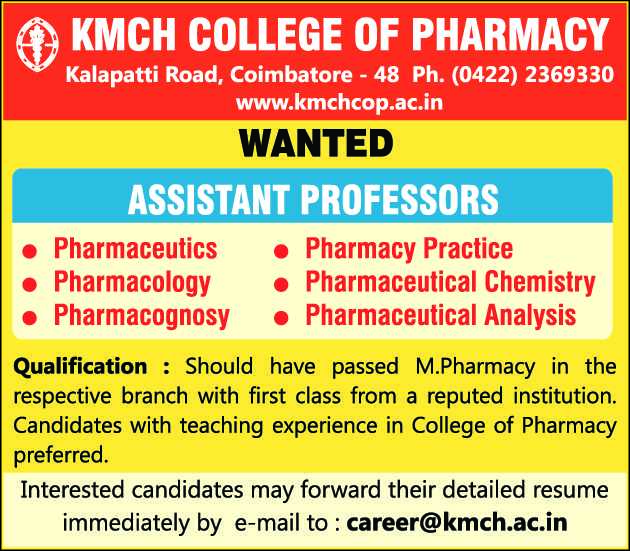 KMCH College of Pharmacy, Coimbatore has advertised in THE HINDU newspaper for recruitment of Assistant Professors jobs vacancies. Interested and eligible job aspirants are requested to apply immediately from 03rd April 2019. Check out further more details below. College Profile: Kovai Medical Center Research & Educational Trust, (KMCRET) Coimbatore is a non-profitable voluntary organization established in the year 1990 with a vision to impart quality education and training at par with International Standards. The Chairman of the Trust Dr. Nalla G. Palaniswami, M.D., A.B., (USA) is a Physician specialized in Endocrinology, Kovai Medical center and Hospital, Coimbatore and the Managing Trustee Dr. Thavamani D. Palaniswami, is a Paediatrician and Adolescent care specialist, Kovai Medical Center and Hospital, Coimbatore. They have wide experience in the field of health care and education; have worked in various advanced Medical Centers & Hospitals in the United States for almost 20 years. As an outstanding and dynamic personality, our Chairman has always rendered a helping hand in all areas like Education, Social Welfare, Healthcare, etc., supported by the administrative acumen of Madam Trustee. At present the KMCRET runs many Educational Institutions. Should have passed M.Pharm with first class. Experienced candidates will be preferred. How to Apply: Interested and eligible candidates are requested to send CV along with copies of certificates / testimonials and recent passport size photos to the email address address provided below.